A longstanding theological maxim states that Christ is the priest, the victim and the altar of his own self-sacrificial offering.1 He is the priest because he is the one who offers, and he is the victim because he is simultaneously the one offered. But his body is also the very “place” of this sacrificial offering, and so follows another traditional saying: “the altar is Christ.” This high theology of the altar comes directly from Christ’s fulfillment of the biblical types that prefigured him. He fulfilled every previous priesthood and every previous sacrifice by becoming the True High Priest and True Victim. So, too, his body fulfilled and replaced every previous altar erected to the worship of God. Christ, then, took up and recapitulated every previous prefigurement of his own action in the world and returned them to the Father in heaven. But in the sacramental system of the Church, the things of heaven come to us as sacramental revelations. Priest and people symbolize the Mystical Body of Christ, scripture makes known the word of God, and, supremely, the Eucharist renders present Christ’s very reality. The things of heaven come to us through signs, but nonetheless provide a real—though sacramental—encounter. In art and architecture, a similar sacramental process occurs. In his 1999 Letter to Artists, Pope John Paul II wrote that in sacred art, some aspect of the Incarnation can be made knowable to the senses as a “sensory evocation of the mystery.”2 In other words, the material “stuff” of the world can serve not only to memorialize things past, but provide a sacramental anticipation of things to come. Simply put, the altar symbolizes Christ himself in the many facets of his existence: as fulfillment of the Old Testament typologies, as God present with his people on earth, and the prefigurement of the eternal, glorious banquet of heaven which is wholly communion and feast. Mystagogical catechesis lies at the heart of every Christian life because it is more than a human pedagogical method; it is the privileged method established for communication between heaven and earth. The God who is outside of time and space created human beings who acquire knowledge through the senses within time and space. Therefore, Christ took on matter in the Incarnation so that he could be seen, heard and touched, and his presence continues in the world in a similar way. A person who learns to see beyond the appearances of a piece of bread and see the Presence of God in the Eucharist has experienced mystagogical catechesis. But this movement from visible signs to invisible spiritual realties does not always come easily. It requires bringing a receptive mind and heart to a foundational literacy of what external signs mean and how they are fulfilled in salvation history. But even the most highly educated person cannot encounter what is not present, and so theological knowledge matters when making any decisions about celebrating the sacred liturgy. If a worshipper is to be led to the mysteries, the signs necessary to encounter those mysteries must be there to be perceived. And here is why ontology matters in understanding the altar: only if the nature of the altar is understood can it be designed so as to express that nature in a way perceivable by others. 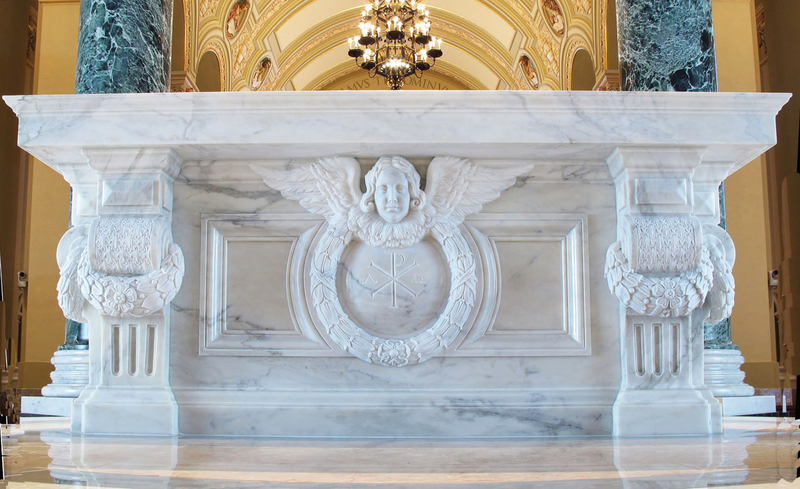 This newly-designed altar made for the renovation of the Cathedral of St. Joseph in Sioux Falls, South Dakota, uses the ornamental motifs of wreath, bundles of leaves and flowers, and the early Christian symbol of the chi-rho to indicate the importance and festivity of the altar. The angel provides “mystical support” for the altar’s mensa. 2011. Duncan Stroik, architect. Cody Swanson, sculptor. Because Christ sums up all things in himself (Eph 1:10), the altar in turn signifies many of Christ’s attributes. In The Spirit of the Liturgy, Cardinal Ratzinger noted that Christian worship is fundamentally different from other religious sacrifices through history. In many religions, a human priest is designated to place gifts upon an altar, hoping they will be accepted by the deity. In Catholic liturgy, however, the priest and people together sacramentalize Christ’s Mystical Body, rendering present in external signs what is already true: Christ himself offering the sacrifice to the Father. “The real ‘action’ of the liturgy in which we are supposed to participate,” he says, “is the action of God himself.”4 Since the liturgy is Christ’s action expressed in the symbol system of the rite, the altar is Christ rendered in architectonic form which rightly takes on the attributes of Christ himself. Four of these attributes are highlighted here. 1. The Altar is Christ. The Catechism of the Catholic Church states plainly that the “Christian altar is the symbol of Christ himself, present in the midst of the assembly of his faithful” (1383). The altar is therefore not a remote and isolated image of Christ, but one standing in the midst of his people. For this reason the altar is given the most prominent location in a church, occupying a place which is “truly the center toward which the attention of the whole congregation of the faithful naturally turns.”5 For similar reasons, the Church’s legislation strongly encourages that altars be fixed to the floor to indicate Christ’s eternity and never-ending commitment to his people.6 Moreover, at least its mensa is to be made of stone, echoing the scriptures which repeatedly call Christ a rock and cornerstone (see 1 Pt 2:4, 1 Cor 10:4, Eph 2:20). Although exceptions are allowed in particular cases for wooden or portable altars, stone is meant to indicate Christ’s strength and permanence. The lighting of candles on the altar follows, not only indicating that festive nature of the event, but to signify Christ as the “light to enlighten the nations.” 10 The rites of the Church, then, lead the viewer from the external sign to the sacramental mystery it makes present: in looking at an earthly object made of stone, even Christ’s holiness can be encountered. Practically speaking, any enrichment given to an altar should increase the revelation that the altar itself is Christ; it should not be a signboard for an unrelated pious image or devotional slogan. The five consecration crosses on the mensa of the altar, for instance, reveal that the altar is Christ because they indicate his five wounds. They belong to the nature of Christ himself, and therefore to the nature of the altar itself. Inset areas of gold mosaic or multicolored stone, similarly, express in architectural terms the gem-like radiance of heaven which corresponds to Christ’s own glory. 2. The Altar is a Place of Sacrifice. Any altar, by definition, is a structure on which sacrifice is offered.11 Sacrosanctum Concilium repeatedly speaks of the Mass as a sacrifice, noting that at the Last Supper, Christ instituted “the Eucharistic sacrifice of His Body and Blood” in order to “perpetuate the sacrifice of the cross through the centuries” (47). The very same sacrifice that Christ offered to the Father on the cross was instituted “in the form of a sacrificial banquet.”12 The Christian altar, then, is fundamentally different from other altars through history because it is not simply a dedicated table upon which gifts are offered to a god. It is Christ present among his people, who then receive the sacrifice that he offers “on” his very person. This sacrificial quality is further expressed by the inclusion of relics under the altar. Traditional explanations claim that the liturgy was celebrated upon the tombs of martyrs in the catacombs of early Christian Rome. Today’s liturgical instructions, however, give primacy to the altar as the object which renders honor to the burial place of martyrs, and so the presence of relics indicates not the sacrifice of the martyrs alone, but more precisely their share in the sacrifice of Christ. The Order of the Dedication of an Altar notes that it is fitting for saints’ relics to be placed under altars so that “the triumphant victims come to their rest in the place where Christ is victim” (5). In designing a new altar, its sacrificial character should be expressed. One of the most effective ways to accomplish this is to make the mensa out of stone of significant thickness, perhaps three inches or more. A colorful stone given a high polish will indicate a glorified altar, one that has taken on gem-like qualities that signify heavenly conditions (Rv 21:19). Relics are no longer placed in the mensa itself as they once were, where a piece was removed from the top slab to insert the relics. According to today’s liturgical instructions, relics are placed underneath rather than within the altar slab itself. This preserves the integrity of the mensa as an image of Christ, and reinforces the place of relics under, and not in, the altar. In this way, the sign value of the altar as an image of the martyrs participating in Christ’s own sacrifice becomes clear, helping the signs lead to revelation of the mysteries. 3. The Altar is a Table. In designing new altars, the tableness of the altar can be brought forward through the use of leg-like vertical supports which need not eliminate the solidity afforded by enclosing the altar’s supports with inset panels. As already noted, heavenliness, in Biblical terms, is frequently associated with gem-like color and reflectivity, and while relatively little should be done to enrich the mensa itself, the supporting structure beneath can include carved or inset ornamental motifs that bring forward the nature of the altar as festive sacrificial table. Similarly, richly colored marbles and inset gold or colored mosaic can indicate the altar’s eschatological status as heavenly banquet table. 4. The Altar is a Sacred Thing. It is worth noting that an altar is a place where sacred actions occur in what the Church again and again calls “sacred buildings.” Sacrosanctum Concilium even speaks of “sacred furnishings.” 20 To be made sacred is to be set apart from other things, and the Rite of Blessing of a Church notes that since churches “are permanently set aside for the celebration of the divine mysteries, it is right for them to receive a dedication to God” (1). Thomas Aquinas writes in the Summa that altars are not consecrated “because they are capable of receiving grace, but because they acquire special spiritual virtue from the consecration, whereby they are rendered fit for the Divine worship.”21 While the altar does receive special treatment in its anointing, incensing, covering and lighting, The Order of the Dedication of an Altar indicates that “the altar becomes sacred principally by the celebration of the Eucharist” (13). In the section entitled “Art at the Service of the Liturgy” in Sacramentum Caritatis, Pope Benedict XVI wrote: “Everything related to the Eucharist should be marked by beauty” (41). Beauty, theologically understood, results when a thing reveals its very nature— its ontological reality—to the viewer. And an altar becomes knowable, and therefore beautiful, when its “altar-ness” is revealed in the very matter of which it is made. A theologically informed architect makes decisions regarding the design of an altar—material, size, shape and level of enrichment— and these decisions are then made into built form. All of these choices in the mind of an architect join with the craftsman’s skill to become outward signs for others to see. Such signs lead the viewer to know what an altar is at the very level of its reality. In doing so, the altar participates in the process of mystagogical catechesis and plays its part in the “sanctification of man [which] is signified by signs perceptible to the senses” (SC, 7). Then an altar will “look like” an altar precisely because it is an altar at the ontological level: a sacred table for a sacrificial heavenly banquet which is an image of Christ himself. Denis McNamara is Associate Director and faculty member at the Liturgical Institute of the University of Saint Mary of the Lake / Mundelein Seminary, a graduate program in liturgical studies. He holds a BA in the History of Art from Yale University and a PhD in Architectural History from the University of Virginia, where he concentrated his research on the study of ecclesiastical architecture of the nineteenth and twentieth centuries. He has served on the Art and Architecture Commission of the Archdiocese of Chicago and works frequently with architects and pastors all over the United States in church renovations and new design. Dr. McNamara is the author of Catholic Church Architecture and the Spirit of the Liturgy (Chicago: Hillenbrand Books, 2009), Heavenly City: The Architectural Tradition of Catholic Chicago (Liturgy Training Publications, 2005), and How to Read Churches: A Crash Course in Ecclesiastical Architecture (Rizzoli, 2011). 1. Preface V of Easter in the Roman Missal includes the phrase: “As He gave Himself into Your hands for our salvation, He showed Himself to be the Priest, the Altar, and the Lamb of sacrifice.” In his classic 1933 work on the nature of the altar, The Liturgical Altar, architect Geoffrey Webb, stated it with typical clarity: “[the Church] has proclaimed again and again that in her mind the altar represents the Lord himself.” Pope Benedict XVI reiterated this in his 2007 Post-Synodal Apostolic Exhortation Sacramentum Caritatis, 23. See further explanation in the Catechism of the Catholic Church (CCC), 1383. 2. John Paul II, Letter to Artists (1999), nos. 7-8. 4. Cardinal Joseph Ratzinger, The Spirit of the Liturgy (San Francisco: Ignatius Press, 2000), 173. 5. General Instruction of the Roman Missal (GIRM), 299. 6. See GIRM, nos. 298, 301. 7. See Rite of Dedication of a Church and Altar (RDCA), “The Order of a Dedication of a Church,” nos. 15-16 and 63-71. 8. RDCA, “Order of Dedication of a Church,” 16. 9. Thomas Aquinas, Summa Theologiae, IIIª q. 83 a. 3 ad 2. 10. RDCA, “Order of Dedication of a Church,” 16. 11. J. B O’Connell, Church Building and Furnishing: The Church’s Way (South Bend, IN: University of Notre Dame Press, 1955), 139. A helpful resource on legislation and theological reflection before the reforms of the Second Vatican Council. 12. RDCA, “The Order of Dedication of An Altar,” 3. 13. RDCA, “The Order of Dedication of An Altar,” 3. 16. RDCA, “The Order of Dedication of An Altar,” 1. 18. RDCA, “The Order of Dedication of A Church,” 16. 19. RDCA, “The Order of Dedication of A Church,” 16. 20. See SC, 122. See also RDCA, Introduction, 3 and GIRM nos. 291 and 294. 21. Thomas Aquinas, Summa Theologiae, IIIª q. 83 a. 3 ad 3.